Hi everyone! Samantha here! Today I am bringing you something a little different. I made a funky, grunge inspired card. My card was inspired by this super cool Kitty Cat Marci stamp from La-La Land Crafts. 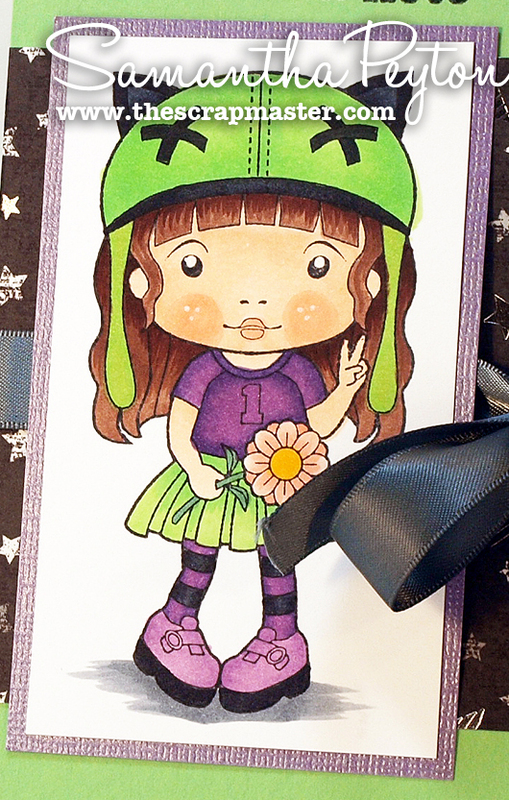 I thought this stamp would be great for a teenie bopper card, so that was my inspiration for this card. Teens can be too cool for your traditional every day greeting card, so I really wanted to make this one super funky. I used bright colors, blacks, grey. I even used this cool foil embellished patterned paper. I also used the C6 for the shadow. That's all for today! Don't forget about our challenge this week! Make sure to play along for a chance to win a great prize. Oh so sweet! I love the design and the layout! OH I love it - it is funky and perfect for a teen! Fun colors and of course your coloring is awesome! This is just an adorable card! The image is just so versatile! I adore your coloring! Fun card! Love the shimmery cardstock behind the focal image... it ties in perfectly with the foil stars! So fun! I've only just gotten here, but not only is the coloring great, I love seeing all the different stamp companies with images that are fun to color...definitely coming back!